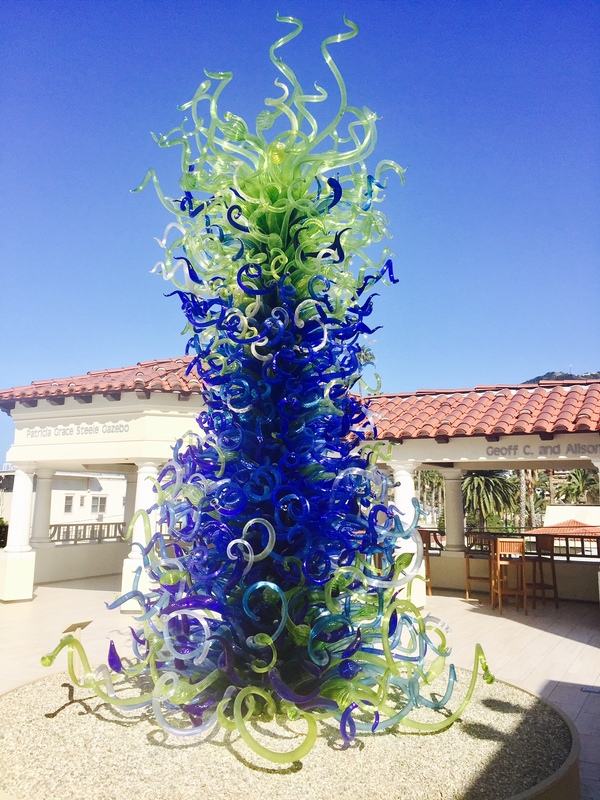 After cruising to Catalina Island on one of the fast and smooth Catalina Express boats, I dropped my bags at the upscale Pavilion Hotel and walked to the new Catalina Island Museum to meet Gail Fornasiere for a tour of the new Chihuly exhibit. The newly opened museum is 18,000 square feet of interior and outdoor exhibit space. Much different from the former 3,000 square-foot Catalina Museum on the ground floor of the Catalina Casino (not a gambling Casino, once a dance pavilion). This new museum offers elegant cultural opportunities for tourists and locals to enjoy. Renowned glass blower, artist and sculptor Dale Chihuly is known for his signature eye patch across one eye, due to a car accident injury, ironically from broken glass in the 1970s. After another injury a few years later, Chihuly couldn’t blow his unique glass art anymore. Instead of giving up, he hired additional glass blowers to help him. Choreographing and directing his team to assemble his pieces into one-of-a-kind art pieces gave the artist a new step back and observe prospective. Standing under an exquisite 18-foot-long blue and cream colored Blue Ridge Chihuly glass chandelier, Fornasiere told me, “Chihuly first made these enormous chandeliers in the 1990s, and realized if you turn them upside down, they make magnificent towers.” Upstairs she showed me Chihuly’s Sea Blue and Green blown glass and steel tower made in 2004. In the mid afternoon, while the sun hit the top of the tower, it radiates like a star on a Christmas tree. Walking through various rooms is a historical journey of Catalina Island and the works of Dale Chihuly. In one gallery, guest learn about Chihuly’s melting and blowing glass technique, which he started in the early 1970s with cylinders and baskets. Fascinated with Native American baskets and their shapes, Chihuly created colorful glass pieces that bend, slump, sag and curve, using heat and gravity as a tool to make these forms. 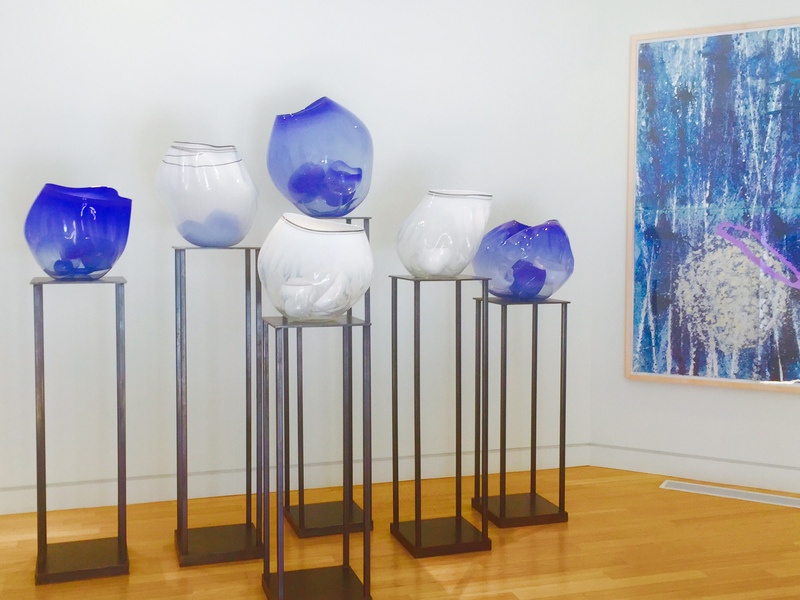 The museum displays his Coastal Blue and Cloud White Baskets pieces resting on high simple black metal and glass stands, offering guests an eye level view of the beautiful shapes and colors. 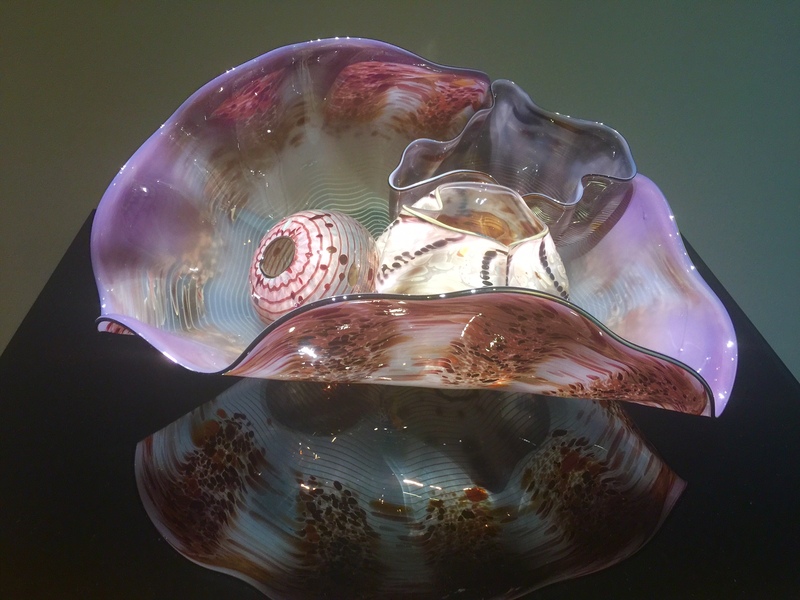 Later during the 1980s, Chihuly became fascinated making sea forms after trips to the ocean and walking along the beach. 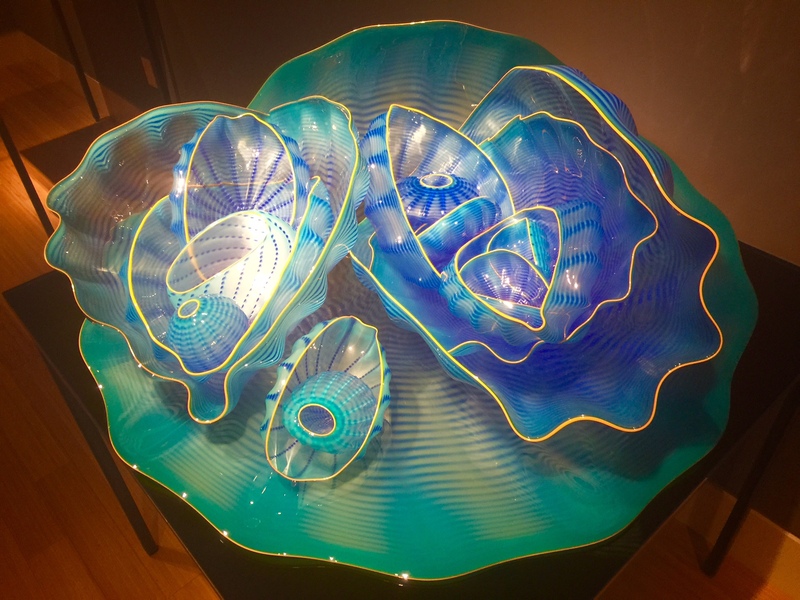 Chihuly experimented with his ribbed basket molds to create his Seaform series. He soon realized that hot glass and its natural properties can easily look like beautiful objects from the sea. Many are displayed on the ground floor of the Catalina Island museum. My favorite is his White and Oxblood Seaform set that was made in 1983. “Guests can get up close and spend time admiring Chihuly’s work without any barrier,”said Fornasiere. 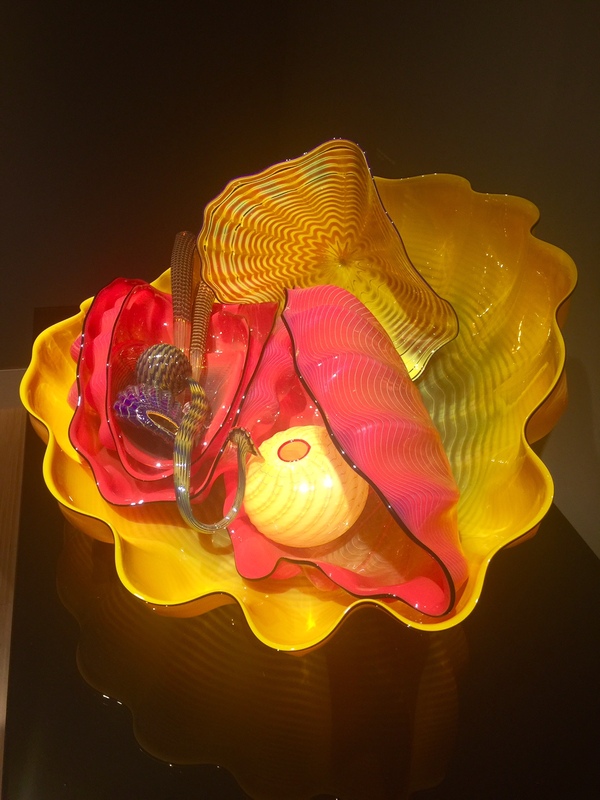 Also in the ’80s, Chihuly began the Macchia series using many of the 300 colors in his studio. He named the series Macchia after the Italian word for spot. Each work is speckled with color by rolling molten glass in small shards of colored glass during the blowing process. 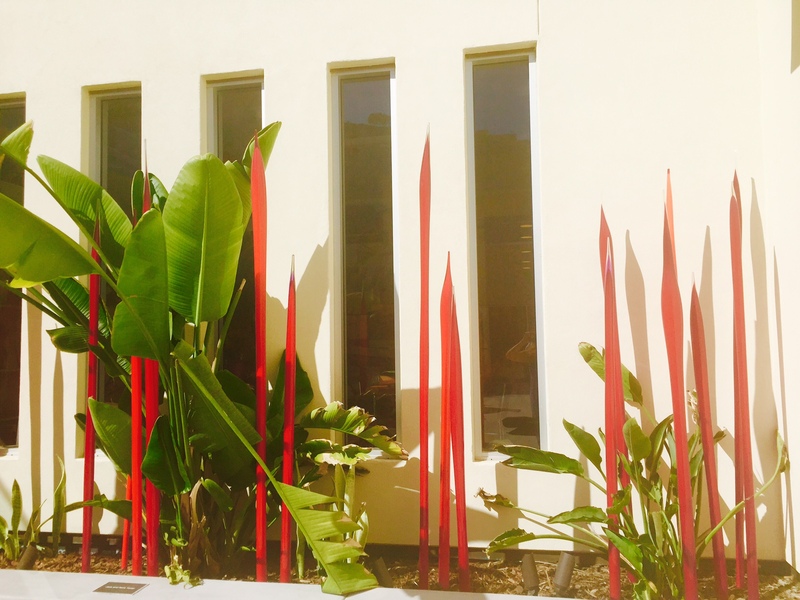 In the landscaped gardens upstairs in the Ada Blanche Wrigley Schreiner building are Chihuly’s Red Reeds strategically placed among green plants. “These reeds are featured at the Clinton Presidential Center,” said Fornasiere. “It was quite an undertaking getting all of these glass pieces to the museum,” Fornasiere said. “They were placed carefully in 53-foot-long trucks from Tacoma, WA and driven to Wilmington, CA to be barged over to the island.” I learned that once they docked at Pebbly Beach, the glass art had to be transferred into four 28-foot-long trucks in order to drive through the narrow streets and around sharp corners to the museum. The town of Avalon is just one mile wide and one mile long and has a population of 3,800. The majority of residents walk, ride bicycles or drive golf carts around town. One of the most breathtaking pieces is the colorful Mille Fiori made in 2016. Named after the Italian word for a “thousand flowers,” this unique series is comprised of organic shapes arranged in single elements and grouped together with a few cobalt blue reeds, yellow, orange and green glass formations. Chihuly’s art appears in collections all over the world, including in the United States, Canada, England, Singapore, the United Arab Emirates and Kuwait. Come see his beautiful collection of colorful blown art in Avalon on Catalina Island from 10 a.m.-5 p.m. daily until December 11, 2017 at the Catalina Island Museum. To learn more about Catalina Island, go to https://www.visitcatalinaisland.com.